Dr. Gabrielle Prato is an established pediatrician in Miami, Florida. She specializes in both inpatient and outpatient care. Dr. Prato considers herself to be an eclectic physician, being fascinated by all aspects of pediatric care. 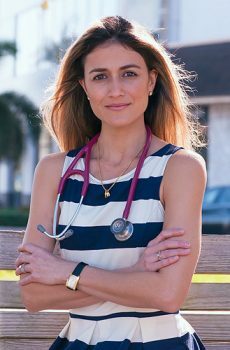 She serves as a pediatric hospitalist and assistant clinical professor in Pediatrics at the University of Miami/Holtz Children’s Hospital, and has practiced locum pediatric medicine in rural parts of Florida. She also provides pediatric emergency care at Homestead Hospital. Gabrielle Prato was born and raised on the small Caribbean island of Aruba. She completed the Dutch “high school” equivalent, known as VWO (Voorbereidend Wetenschappelijk Onderwijs), which is the highest variant in the secondary Dutch educational system. After high school she forewent her appointment at the “Vrije Universiteit” in Amsterdam, one of the Netherland’s most prestigious medical schools, and decided to pursue her academic career and eventually her medical career in the United States. In 2007 she graduated with honors from Florida International University, where she received a Bachelor of Science Degree in Chemistry. She subsequently worked for 1 year, as a high school science teacher at Ronald Reagan/Doral High School, where she was elected “Teacher Of The Year” and nominated for “Regional Teacher of the Year for Miami-Dade County Public Schools”. In 2009 she began her medical studies at Nova Southeastern University, College of Osteopathic Medicine, where she focused on pediatrics and preventive care. After medical school she completed her Pediatric Residency at Jackson Memorial Hospital in Miami, Florida. Dr. Prato considers her calling as a pediatrician a true gift. She is humbled and honored to be entrusted with the task of taking care of children during their most vulnerable moments. In her practice style she emphasizes preventive care and focuses on optimizing the body’s innate ability to aide itself in the healing process. She aspires to elevate pediatric care by providing her patients and their families a unique & personalized experience in the comfort of their residence. She is a Fellow of the American Academy of Pediatrics (AAP) and American College of Osteopathic Pediatricians (ACOP). In my scope of practice I provide patients and their families with the highest quality of pediatric care. I focus on preventive care, and compliment my practice with evidenced based medicine. I evaluate my patients in the comfort of their home, hotel room or current residence. I spend quality time counseling families regarding clinical findings, interpretation of these findings, medical assessment and proposed treatment plans. As a pediatrician, I am a big advocate of family centered medicine, and encourage families to be directly involved in their child’s care and medical decision making, and coming up with treatment plans together with me. My patients and their families have my cellular phone as well as my personal beeper number. I am directly available over the phone or via e-mail throughout most of the day. If I am with another patient or rounding at the hospital and unable to answer my phone or pages immediately, I typically will respond to your call within the hour. Copyright 2018 At Home Pediatrics.